While a Fellow at the East-West Center in Hawaii, USA, taking part in the Asia Pacific Leadership Program (APLP), I was introduced to the concept of ‘Talking Story’. 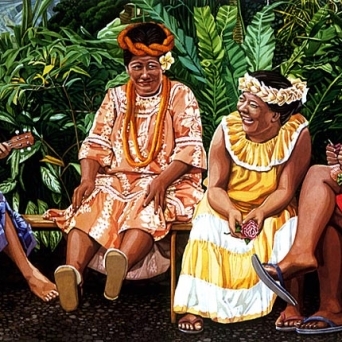 This Hawaiian tradition involves sharing history and experiences via storytelling and is a strong element of their culture. At first I viewed this practice as little more than chatting, but slowly began to appreciate the importance that verbally sharing stories can play in societies. There’s no arguing the power that sharing history orally had prior to the advent of the written word and widespread publishing, but I had a difficult time fully appreciating its impact and place in modern times. During my stay in Hawaii I read a book about legendary Hawaiian waterman Eddie Aikau, Eddie Would Go. It beautifully documents his life and mythical demise while a crew-member aboard the Hōkūleʻa as it departed Hawaii in 1978 to begin its 30-day journey to Tahiti, using only the stars and natural environment to find its way. The story is captivating, heartbreaking, and a strong case in leadership, the focus of APLP. One evening, my cohort and I were treated to a personal meeting with Nainoa Thompson, Director of the Polynesian Voyaging Society (PVS), and the last person to speak with Eddie before he paddled off on a surfboard in high seas to seek help and was never seen again. While I ‘knew’ the story of Eddie Aikau and Hōkūleʻa’s capsizing, I realized I didn’t really ‘know’ it until Thompson recalled the incident verbally with us that evening at the PVS. Hearing his words, his trembling voice, and seeing the look on his face as he stared at the ground while recounting the tale brought even greater meaning and understanding that resonates strongly with me today. Verbal storytelling simply can’t be beat for impact and clarity. While sharing verbally is ideal, in an ever-increasing digital age dominated by 140-character notes, extended storytelling in any medium has greater importance than ever, and in surprising sectors. A blog by Andrea Edwards about a storytelling master-class in Singapore featuring Steve Clayton, Chief Storyteller for Microsoft, reminded me of the evening with Thompson, talking story, and the power of storytelling. But Microsoft’s storytelling holds great power in a different sense – in the corporate arena. Microsoft Stories was created a few years ago to share the company’s endeavours with employees, tales of success, but more importantly to manage their message rather than letting the media dictate it. The results have been surprising and impressive. While the Hawaiian tradition of ‘Talking Story’ and Microsoft Stories may seem unrelated, they’re both passing along history and informing opinion, albeit in completely different mediums, but demonstrating the power storytelling has, even in our modern digital age. It’s time to start sharing more stories.